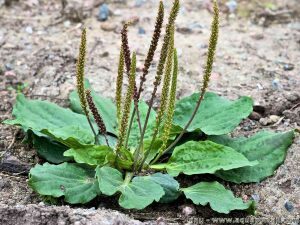 Plantago major is a species of genus Plantago known by the common names English plantain, narrowleaf plantain, ribwort plantain, ribleaf, buckhorn plantain,buckhorn, and lamb’s tongue. P. major contains phenylethanoids such as acteoside (verbascoside), cistanoside F, lavandulifolioside, plantamajoside and isoacteoside and saponin. The studies also indicated that increasing the level of wound healing and collagen plantago herb. The decreased level of MMP-12, located in the ECM, laminin, are protected from degradation of elastin and collagen protein matrix components and indicates that the continuity is maintained. Especially at high rates of plantago herb contains saponins which is the fibroblast inhibition of matrix metalloproteinases (2), and studies that increase collagen synthesis are available (3). Applications: For use in skin care products, especially those for ageing, anti-wrinkle and mature skin. 1-Mirko Manetti, Serena Guiducci, et at. Increased serum levels and tissue expression of matrix metalloproteinase-12 in patients with systemic sclerosis: correlation with severity of skin and pulmonary fi brosis and vascular damage. Ann Rheum Dis 2012;71:1064–1072. 3- Young Soo Kim1, Ik-Hyun Cho. Therapeutic Effect of Total Ginseng Saponin on Skin Wound Healing. J. Ginseng Res. Vol. 35, No. 3, 360-367 (2011). Morlab Biotechnology is engaged in cosmetic active ingredient (raw material) research and development activities. Laboratory services for In Vitro and In Vivo tests.